Easily identified by their long, black and white ringed tails, these primitive primates are gray and white in color, with brown or yellow eyes and circular black eye patches. Unlike other lemurs, ring-tails spend nearly half their time on the ground sunning, playing, and foraging. When moving, these social lemurs carry their bushy tails straight up in the air. Seasonal fruits (especially figs) are favorite foods of ring-tailed lemurs. These opportunistic foragers also munch on leaves, flowers, bark, sap, and sometimes invertebrates. Although they are skilled climbers, ring-tailed lemurs spend more time on the ground than most other lemurs. They live mainly in dry, spiny forests and lush forests along rivers in southern Madagascar. 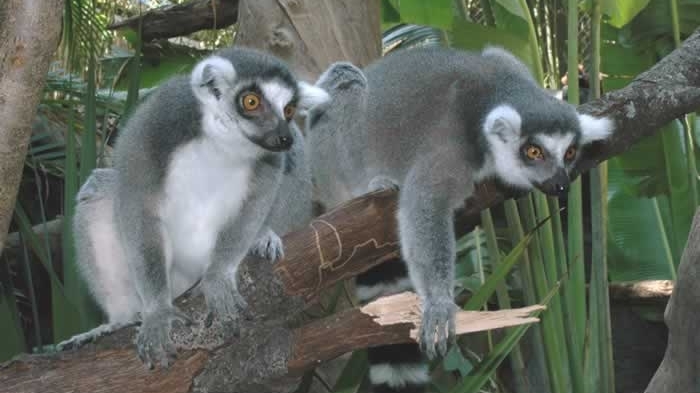 These lemurs are very social and live in groups of up to 25 animals. Males rub scent from their wrist glands onto their tails, then wave their tails at each other. The winners of these “stink fights” get to breed with the females. Ring-tailed lemurs are currently listed as “Near Threatened.” They do occupy all five of the protected areas in their range, as well as two private reserves. But because they live only in a small portion of an island nation, the continued loss of habitat squeezes their population tighter every year. Head & body: 15 in. 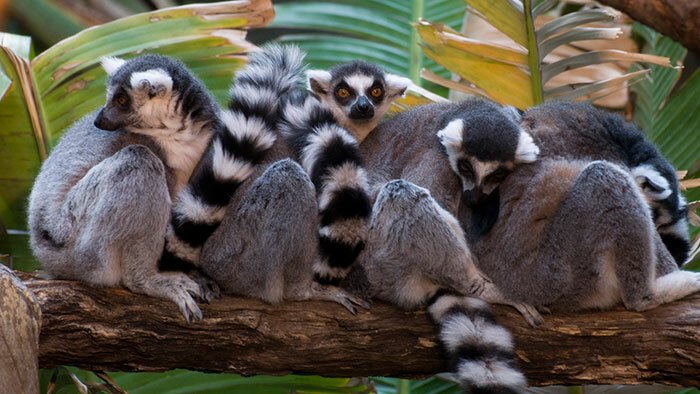 Grooming is an important part of group bonding, and lemurs have built-in grooming tools. The “tooth comb” is made up of the lower six teeth, and the “toilet claw” is an enlarged nail on the second toe. Ring-tail society is dominated by females. They get first access to the best food items and sleeping areas. 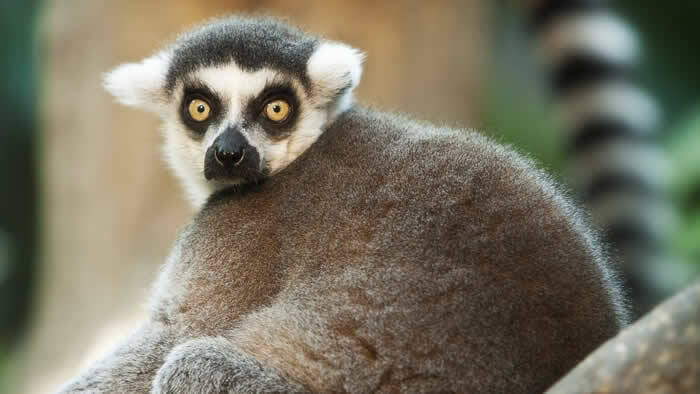 While most primates’ noses are flat and dry, lemurs have long, wet noses similar to dogs. They can smell a favorite fruit from 1000 ft. away! Ring-tailed lemurs are very adaptable and can tolerate disturbed forest and some human encroachment. Ring-tailed lemurs are threatened by habitat loss due to farming and harvesting wood for fuel. These lemurs are sometimes also hunted for food or kept as pets. Captive populations of this species are managed for breeding purposes under a Species Survival Plan (SSP), which, through the coordinated efforts of North American zoos, helps maintain a healthy gene pool for future populations. The Minnesota Zoo currently participates in 23 SSP programs, including the Ring-tailed Lemur SSP.